A woman sits alone and thinks to herself. A painting converses with a room. The room talks back. 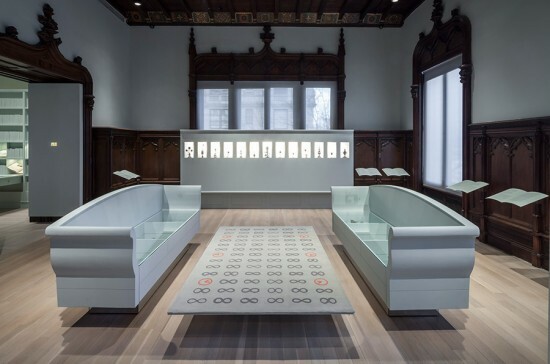 Inspired by the design of the Talmud, the central text of Rabbinic Judaism, where the original text is framed by annotated scholarly debates across generations, the exhibition is entitled As it were…So to speak. 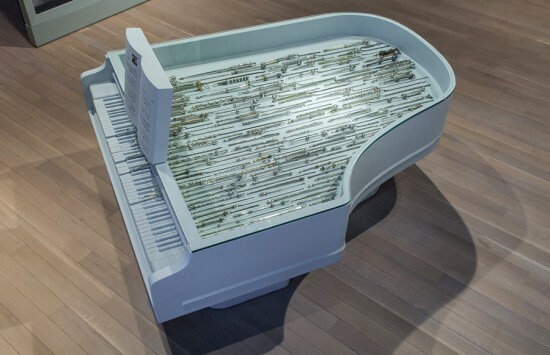 That suggests “what you are about to hear … Is not exactly what it appears to be.” The exhibition is a narrative but without beginning, middle, and end, which harmoniously surfs the practices of art, architecture, and design. The solitary woman described above, sits in thought during Sabbath preparation in Isidor Kaufmann’s painting Friday Evening, from 1920, which hangs in the Warburg dining room. 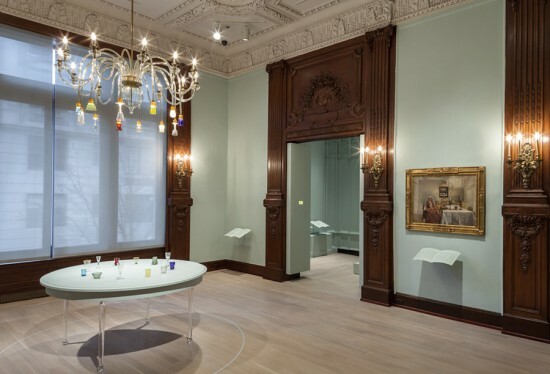 In it, she sits below a chandelier that served as the model for the actual lighting fixture that hangs in the room, a new commission by Bloom for this exhibition called Twelve Glasses (2013). It features 12 vessels in “an inverted parallel world” that mirror 12 glasses from the collection on the table directly below. Hanging across from Friday Evening is a framed reproduction of the painting in reverse, a mirror-image of the room. Viewers experience multiple inversions, reflections, and double-takes, but are in on the joke. Only the eyes are visible in portraits in the entryway and interstitial pilasters; the rest of their faces are masked out. Visitors engage directly with these sitters behind the masks who face off across on opposite sides of the hall (as banter from Curb Your Enthusiasm and Annie Hall plays). This roundelay of characters reminded me of comedian and musician Steve Allen’s PBS program Meeting of Minds, 1977-81, a dinner party populated by historical figures—Plato, Martin Luther, Cleopatra, Marie Antoinette, Thomas Paine, Thomas Jefferson, Karl Marx, Charles Darwin—using their actual words to converse about philosophy, religion, history, and science. Barbara Bloom imagines Nefertiti, Emile Zola, Amy Winehouse and Jesus playing games with an 1898 board game on the Dreyfus affair and a game using playing cards made from a desecrated Torah scroll, at a table off the dining room. In fact, the exhibition is laid out in distinct rooms of the house, and the objects are displayed in vitrines in the shape of furnishings. “I thought, what if we ‘furnished’ the house, but that it wasn’t really furniture. The objects that we ended up building are between furniture and cases and sort of ghosts of places where people could have congregated,” said Bloom. It reflects the ambiguity of the mansion turned museum that is now lies somewhere in between. In the dressing room, a Freudian “couch,” a “chair,” and a “vanity” hold amulets, charms, watches, and gifts (some actually exchanged with Freud). In the bedroom, the “bed” cradles marriage and divorce contracts, and Bloom imagines The Song of Songs sung by Leonard Cohen and Lou Andreas-Salome, one of the first female psychoanalysts and friend of Nietzsche, Wagner, Freud, and Rilke. Also in the room is a window case with silhouetted objects in colored frames to represent synesthesia, the neurological condition that simulates one sense for another, such as colors for words. Here are representations for Kandinsky, Mozart, Marilyn Monroe, Jimi Hendrix, and Pythagoras. The “cupboards” that lead the way to the next exhibition, Stefan Sagmeister & Jessica Walsh’s Six Things, contrasts talismans of memory of the same subject, the holocaust, captured in film: Claude Lanzmann’s Shoah and Steven Spielberg’s Schindler’s List. The “cupboards” and “drawers” contain hats, and empty cases for pipes, scrolls, shofars, and circumcision implements. Bloom’s text then focuses on how Friederich Nietzsche’s sister, Elisabeth, distorted his writings after his death to support her anti-Semetic beliefs, which he had vociferously argued against in life. These empty cases are perhaps the clearest interplay with traditional museum display—or its absence. Overall, the result is an immersive, spatial exhibition that can be experienced on a series of levels, digging ever deeper into this hall of mirrors. As it were…So to Speak: A Museum Collection in Dialogues with Barbara Bloom at the Jewish Museum, 1109 Fifth Ave. closes August 4, 2013.